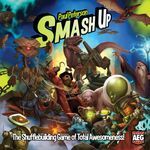 Smash Up + Awesome Level 9000 expansion. Shufflebuilding game where you build a deck each game from two different factions - the only game where robot pirates take on zombie plants and ghost ninjas. Plays in ~45 minutes and is very quick to teach. The expansion adds 4 more factions (to the original 8), some much-needed VP tokens and reprinted base cards with larger text.